Startup Savioke has raised international capital for its Relay delivery robot, as Intel invests in robots as future users of its chips. Savioke Inc., which makes the Relay delivery robot for the hospitality industry, has raised $15 million in Series A funding. “The time has finally come when robots are going to be at our beck and call, and for our robots in the hospitality industry, we mean that quite literally,” he said. Relay is already in use as a service at six hotels in California and has completed more than 12,000 autonomous deliveries since its launch in 2014, according to Santa Clara, Calif.-based Savioke. Toothpaste is the most commonly delivered item. Intel Corp. expects robots to be a major user of its processors, since the markets for personal computers and smartphones have leveled off. At last week’s Consumer Electronics Show in Las Vegas, Intel also announced investment in personal transport company Segway Inc., which was bought by rival Ninebot Inc. last year. This brings the valuation of Segway, which demonstrated a vehicle/robot hybrid at the show, to $1 billion. At CES 2016, Intel also showed off a Yuneec Typhoon H aerial drone whose collision-avoidance systems use its RealSense sensors. In addition to Intel Capital, other investors in Savioke include Hong Kong-based Northern Light Venture Capital and EDBI, the corporate investment arm of the Singapore Economic Development Board. Last fall, Savioke partnered with Singapore’s Hotel Technology Conference to introduce Relay to the Asian hospitality market. “Singapore’s progressive technology environment, together with our deep talent pool and vibrant ecosystem, is well positioned to accelerate Savioke’s growth plans in Asia with EDBI’s assistance and connections in the region,” said Swee-Yeok Chu, CEO and president of EDBI. Savioke had previously raised $2.6 million in 2014. The company, which won Best Consumer Solution for Relay at RoboBusiness 2015, is hiring roboticists and engineers. 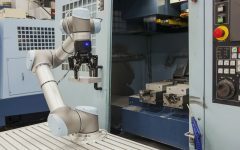 Venture capital funding for robotics has grown from $193.6 million in 2011 to $922.7 million last year, according to industry observer Travis Deyle.